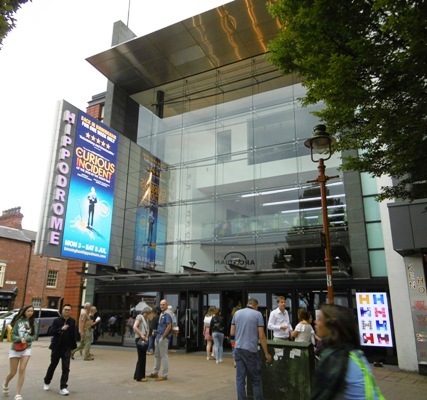 When The Curious Incident of the Dog in the Night-Time visited Birmingham Hippodrome two years ago it was smash hit (review here). The National Theatre production in now on the road again with a new cast after wowing London's West End. The programme states that ''no animals were harmed in the making of this production'' which is a relief because the play begins with the sight of a pet pooch lying centre stage skewered by a garden fork. The dead dog belongs to a neighbour of 15-year-old Christopher Boone who decides to follow in the footsteps of his detective hero Sherlock Holmes and discover who killed the canine. Christopher has behavioural difficulties, caused by Asberger Syndrome, which means he is supremely logical and gets very upset when things don't go to plan. This initially creates some on-stage humour but we soon realise that the search for the dog killer has opened up a whole new can of worms (a phrase Christopher would not approve of as he dislikes metaphors because they're not logical). Simon Stephens' adaptation of Mark Haddon's best-selling novel has already achieved considerable success – five Tony awards, seven Olivier awards – and this second UK touring version will only increase its number of admirers. It makes you laugh, cry, think – and possibly cheer out loud. The standing ovation at the end of opening night at the Birmingham Hippodrome was richly deserved. Everything comes together beautifully. The set is innovative, the acting first class, the direction (by Marianne Elliott) impeccable. The audience appears to be looking into a black box, with the walls and floor containing LED lights and pixels that create pictures, maps, numbers and words. The props are sparse but effective – light boxes are moved around to become chairs, tables and desks, while in the first half Christopher constructs model railways using parts obtained from cupboards concealed in the walls. One of the ways Christopher's AS manifests itself is in his mathematics skills. He's set to be the first person at his special school in Swindon to take a maths A-level – and he's due to sit it three years earlier than usual. His mind is able to understand complex equations and he dreams big. He loves the stars, the planets and outer space and wants to be an astronaut. Yet, while his mind soars, his body goes nowhere. He hates crowds, rarely travels far from home and is told not to go out alone. When he eventually visits London on a train we appreciate his predicament thanks to the on-stage technology which creates a sensory overload of light, sound and movement that soon becomes overwhelming. This is not just about cutting edge technology, however. There are moments when the cast create an illusion by just moving around the stage. There are choreographed set-pieces when Christopher is hoisted aloft by the actors and transported at head height, almost like a ballet. The actors themselves are superb. The four leads are supported by six hard working ensemble members who create a multitude of characters. Well done, Debra Michaels, Eliza Collings, Oliver Boot, Bruce McGregor, Joel Harper-Jackson and Crystal Condie. Scott Reid, as Christopher, is a revelation. You may know him for his role as murder suspect Michael Farmer in the sensational recent series of Line of Duty. His occasional outbursts of violence are realistic, yet we empathise with him, fearing for his safety on the train to London and rooting for him in his A-level exam. And he has great comic timing. Lucianne McEvoy as understanding teacher, Siobhan, is a welcome oasis of calm in Christopher's frantic world, while David Michaels and Emma Beattie, as Ed and Judy, Christopher's mum and dad, portray perfectly both their frustration with, and love of, their son. The novel is now a set text in schools around the world. Mark Haddon states that he's uneasy about it being seen as a textbook for policemen or social workers because it's about more than disability and our attitudes towards it. More than enough for a thought-provoking night out at the theatre, in fact! Sept 4 - 16: Milton Keynes Theatre. Why? Mark Haddon’s best-selling novel is brought to life on stage. When: At Birmingham Hippodrome until July 8, 2017, then touring until September 16, 2017.